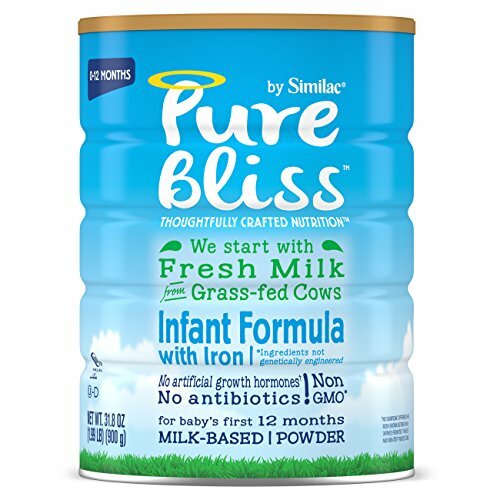 Pure Bliss by Similac Infant Formula with Iron is modeled after breast milk and carefully crafted to nourish your baby for the first 12 months of life. Our formula starts with fresh milk from grass-fed cows and has no artificial growth hormones* or antibiotics, and it’s non-GMO.† Pure Bliss has DHA and ARA, nutrients like those found in breast milk that support brain and eye development. It’s thoughtfully crafted nutrition from the brand trusted by moms for over 90 years. Four 31.8-oz cans of Pure Bliss by Similac Infant Formula make approximately 240 (4-fl-oz) bottles. * No significant difference has been shown between milk derived from rbST-treated and non-rbST-treated cows. † Ingredients not genetically engineered. If you have any questions about this product by Similac, contact us by completing and submitting the form below. If you are looking for a specif part number, please include it with your message.